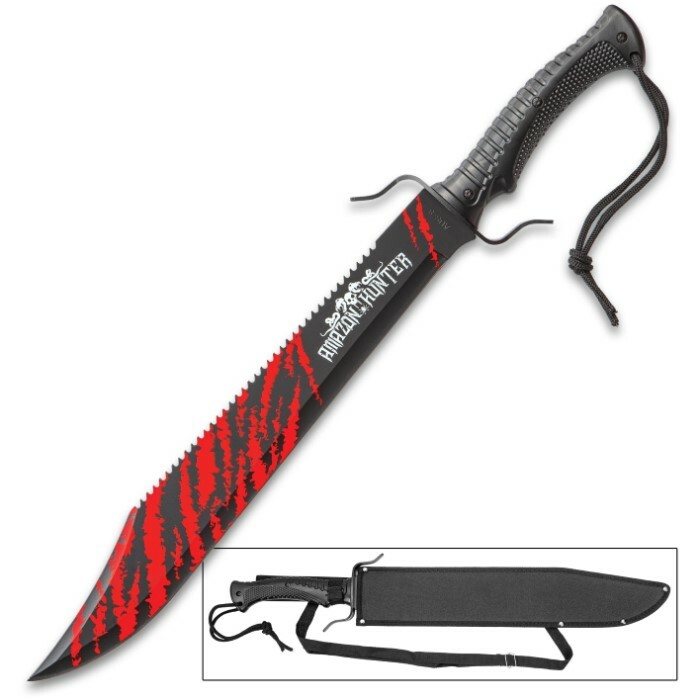 Black Legion Amazon Hunter Machete With Sheath - AUS-8 Stainless Steel Blade, Blood Red Artwork, TPR Handle - Length 25” | BUDK.com - Knives & Swords At The Lowest Prices! 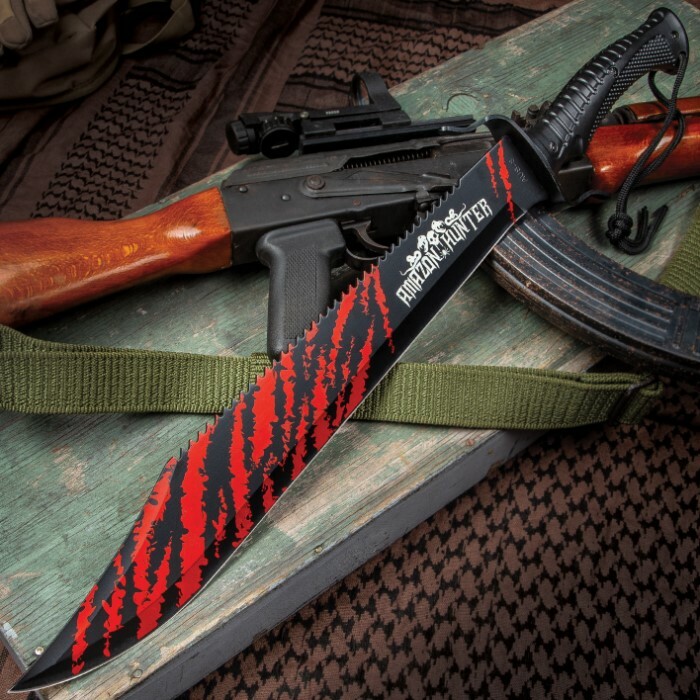 Visceral to look at and impressive to wield, our Black Legion Amazon Hunter Machete gives you the impression that it’s already won the battle! 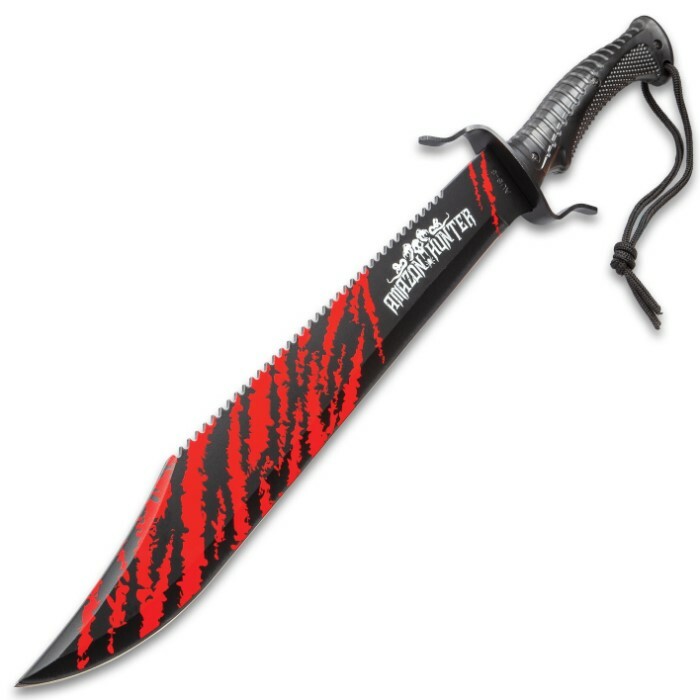 The full-tang, 17 3/4” AUS-8 black stainless steel blade features vivid blood striped artwork and the Amazon Hunter logo. 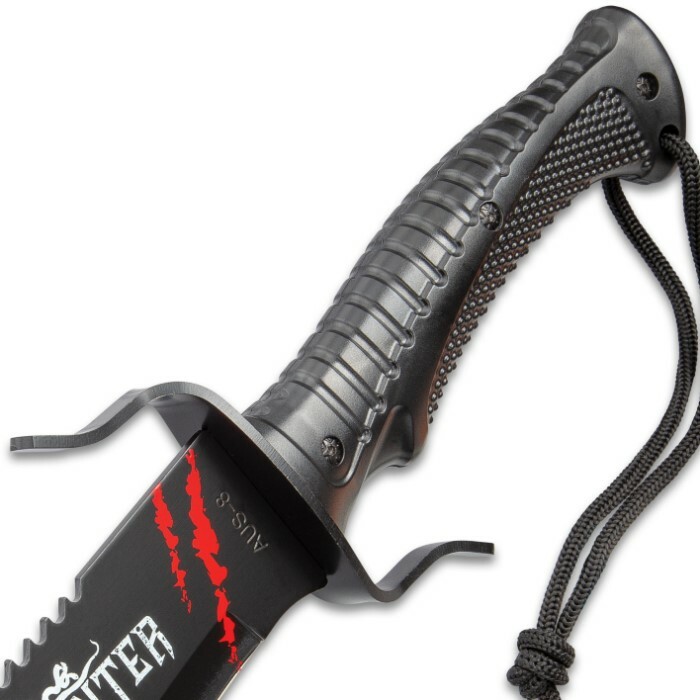 The blade has a wicked sawback spine and thru-holes to reduce the overall weight. The textured handle is heavy-duty TPR, secured to the tang with screws, and it has a lanyard in the pommel and a metal guard. 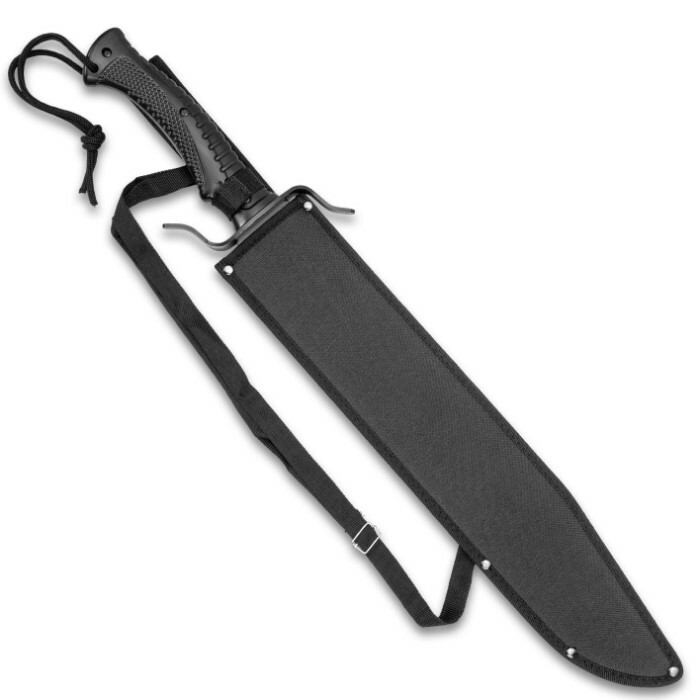 The massive, 25” overall machete slides securely into a premium nylon belt sheath with an adjustable shoulder strap. 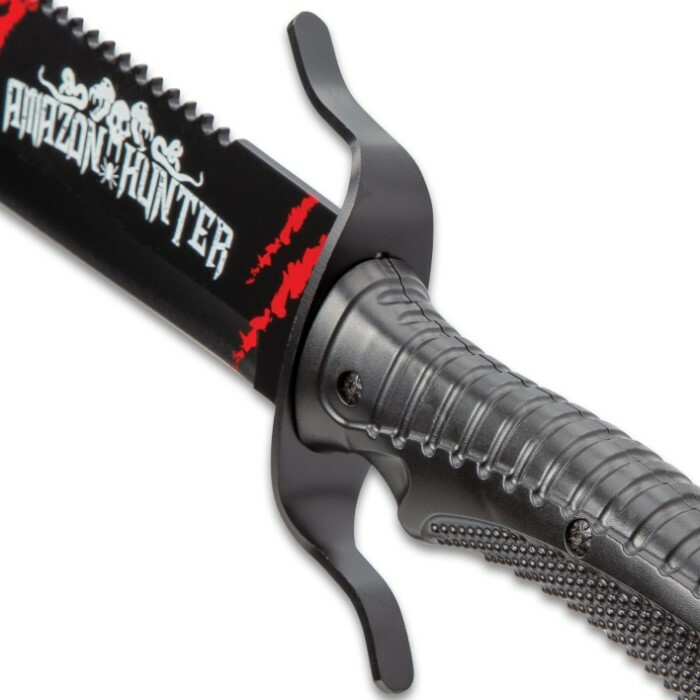 This Amazon Black Legion Hunter Machete is the best one I've bought so far ! Comes RAZOR SHARP and I MEAN RAZOR ! It looks like it has very little weight , but, it is very well made, looks fantastic, feels great in your hand with a good grip. ! Don't hesitate , buy it, you'll be glad you added this to your collection and it WILL BECOME YOUR FAVORITE. ! !